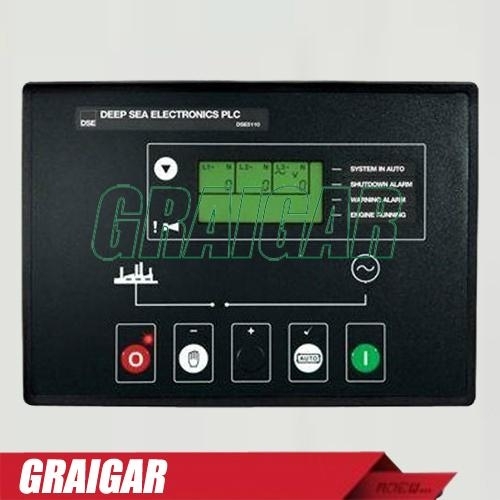 The Deep Sea Control Model 5110 is an Automatic Engine Control Module. The module is used to automatically start and stop the engine,indicating the operational status and fault conditions by means of an LCD display and a flashing LED on the front panel. Selected operational sequences, timers and alarms can be altered by the user. Alterations to the system are made using the 55xx configuration software with the 810 interface and a PC. This interface also provides real time diagnostic facilities. It is also possible to monitor the operation of the system either locally or remotely. Access to the module is protected by PIN number to prevent unauthorised access. Front panel configurable inputs,outputs, alarms and timers. LED & LCD alarm indication Compatible with 5200 series modules for easy upgrade path.